Carrying your pen and in essence wearing your pen can be the same thing for many men. 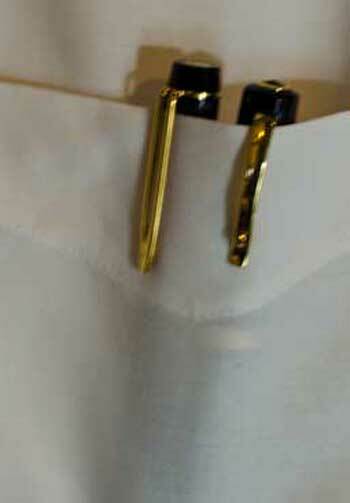 For many, carrying a pen is wearing it in a shirt pocket. I often get asked about how I carry the pens that I use everyday. Working in an office environment, I always have a pen in my shirt pocket, sometimes two. When travelling, I tend to keep a pen or two in a leather case, in my camera bag. I do not want the strap of the camera bag to pull a pen out of my pocket. So at work, it is a pen in my shirt pocket. Anything more than two pens in a shirt pocket and the weight pulls the pocket out too much. With pens clipped in a shirt pocket, it is always advisable to check to ensure the pen clip is tight to the body of the pen. You don't want to bend over and have your pen fall out onto the floor. Keep your pens clean, as if there is ink build up in the cap, there can be some transfer of ink from the inside of the pen cap to where the clip is attached, if the clip is attached through the cap itself. For example, the Waterman pen in the picture to the right has a clip that is attached to a ring at the top of the pen cap. No hole in the cap. But the OMAS Arte Italiana pen, the clip is attached through the cap through a opening. 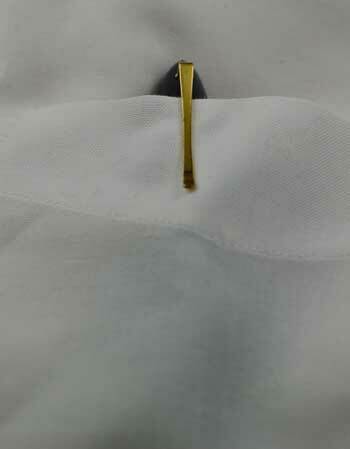 Those openings, if there is ink build up in the cap, can mean ink will be drawn into the cotton of the shirt pocket. I tend not to carry a pen in my suit or sports coat jacket pocket. 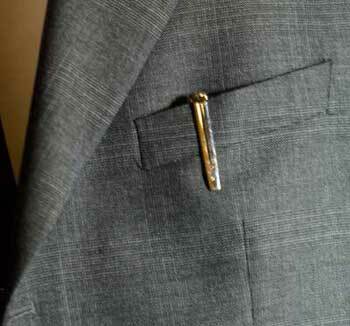 While a pen clip always looks good in jacket pocket, often I attend meetings where I am not wearing a jacket. In fact, often I take my jacket off when in the meeting. I have seen the pen in the jacket pocket as being described as the more European way of carrying you pen. Look around the next business meeting you attend. The number of men wearing jackets and ties is diminishing. 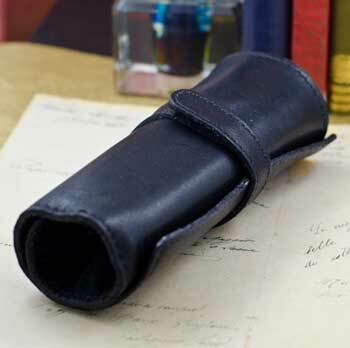 I often carry a small pen case with one or two pens, in addition the the pen I would be using that sits in my shirt pocket. Having a couple of pens in a leather pen case means I can keep a couple of extra pens on the table and easily change the pen I am using depending on the need. Pens with a broad nib are great for taking notes as the nib smoothly flows across the paper. Making fast notes is important. But if, say a document is being reviewed and notes on the document are being made, one of the pens with a nib closer to a medium would be more appropriate. Also, depending on the length of the meeting, and the amount of writing, it allows for a quick change without stopping to fill up the pen. If I am attending a long workshop, well I may bring one of my leather rolls. 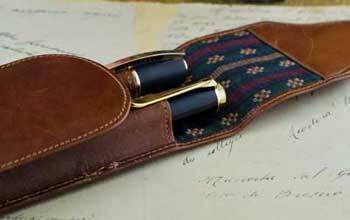 Five to six pens nicely fit in the leather roll. It means for a long workshop I can have pens with different nib widths or different ink colours. All the flexibility needed for a long session. I tend not to carry pens in my pant pockets. I may have a set of car keys or coins in my pocket and I am concerned about scratching the surface of the pen. But primarily as depending on the depth of the pocket, I am concerned about the pen falling out. It could fall out of the pocket and I would most likely not even notice it missing until I reached in to retrieve the pen. So to those that ask, do you bring just one pen with you? Never. Having a variety of pens in nib widths and ink colours ready with you is one of the ways I rotate pens so they are regularly used and also it means I always have the best pen for the best purpose. Writing a thank you card? I tend to have to use a medium-broad nib. Sign a letter? Here is where the broad or double-broad nibs create great signatures. Edit a report? The medium nibs really become helpful for these tasks. Your pen, an expression of you.